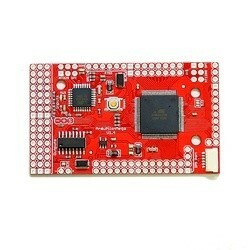 This is the new ArduPilot Mega 2560, Arduino-compatible autopilot board using the new ATmega 2560. 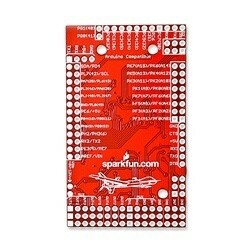 The original version of this board (with ATmega1280) was used to win the annual autonomous vehicle competition organized by SparkFun. The ArduPilot ATmega 2560 is a fully programmable autopilot that requires an Oilpan IMU and GPS unit to create a functioning Unmanned Aerial Vehicle (UAV). The ArduPilot Mega autopilot handles both the stabilization and navigation, eliminating the need for a separate stabilization system. It also supports a "fly-by-wire" mode that can stabilize an aircraft when flying under manual RC control, which means that it makes it easier and safer to fly. The hardware and software is open source and the board comes with all the surface-mount parts already soldered, but requires the user to solder on an included 3 x 16 connector. The RC interface firmware is already loaded, however the autopilot software must be downloaded and loaded onto the board by the user. All details and instructions can be found at the project's home page. 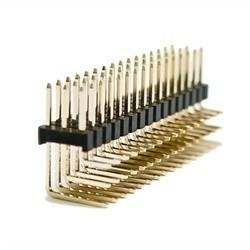 Please note: The ArduPilot Mega is not supplied with the male pin headers. To connect the Ardupilot to the RX you will need female to female servo cables or radio wires, they come indifferent lengths, you will need as many cables as channels you are using on the autopilot. It can be programmed with the Arduino IDE. All details and instructions can be found at the project's home page.